The Plymouth Barracuda was produced for 10 years starting in 1964 until the last unit rolled of the assembly line in 1974. 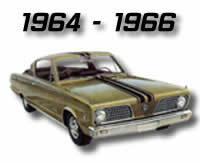 Over that 10 year period of time, the Barracuda went through many body changes, as well as under-the-hood. In 1964, Plymouth released the Barracuda. Based on the Valiant, and the Barracuda was actually just a Valiant option package. Plymouth released the Barracuda on April 1, 1964, two weeks before Ford released its Mustang. Like the Valiant, the Barracuda was an A-Body. The base engine on the Barracuda was the 225 ci slant 6, which put out 145 horsepower. Special order upgrades were available for a 180 hp 273 ci V8. Most customers ordered the upgraded V8. Even though the Barracuda was an inexpensive car and received strong reviews, the competing Ford Mustang outsold the Barracuda 8:1. In 1967, Plymouth completely redesigned the Barracuda. The Barracuda no longed shared any body panels with the Valiant. There were two new body styles available, convertible and coupe, which added to the fastback body style. With the updated redesign, the engine bay was redesigned to accept a greater variety of engines. Along with the 225 ci, and the 273 ci, the Barracuda was now available with the 383 ci. In 1968, the engine line-up changed again. The base 273 ci was replaced by the 318. The 383 ci received a boost in horsepower, mostly because of better heads. The new engine for this year was the 340 ci. Chrysler rated the 340 ci at 270 horsepower, but NHRA rated it at 290 horsepower! 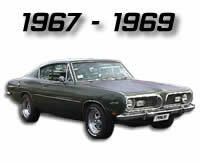 In 1969, Plymouth finially released the ‘Cuda model, which was just a high preformance version of the Barracuda. The 340 was left almost unchanged, but the 383’s horsepower was increased to 330 hp. Then around April of 1969, Plymouth added the 440 ci to the engine line-up. Even though the 440 ci was rough handling, it could race from 0 – 60 miles per hour in 5.5 seconds, and race a quarter mile in 14.10 seconds at 104 miles per hour. Finally with the release of the 340 Formula S, Chrysler offered even more horsepower than the standard 340 engine with the handling of the standard 340. In 1970, the Barracuda received a major redesign. 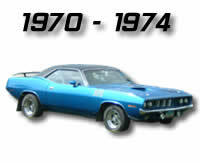 The newly redesigned Barracuda was based on the E-Body platform, which was shared with the Dodge Challenger. One of their main goals for the E-Body was to be able to throw any engine they wanted in these cars, from a small slant six, to a larger 426 Hemi. To achieve this they used the cowl from the bigger B-Bodies, such as the Road Runner, and worked it into the design of the car. There were four different types of hoods that were put on Barracudas. The regular flat hood was standard. Another model had a non-functional hood scoop on the hood. Other models had the shaker hood, which had a flat hood with a whole cut in the middle where there was a hood scoop extending out from the engine and took in fresh air. Last but not least was the AAR hood. You can read more about the hood that was on the AAR on the AAR ‘Cuda page. In 1970 they produced what they called the AAR ‘Cuda. AAR stands forAll American Racers. The AAR ‘Cuda was offered as a SCCA road racer which was to compete with the Ford Mustang. Helping to restore a 1967 GTX. Does anyone reproduce the Vehicle Identification Plate on the dash pad? We have the original, but need one with better stenciled logo. Just found a remote control model of a 71 barracuda, awesome, orange & black, working headlights, motor sounds, and will fly. Its 18″ long made by West Coast Choppers. 1965 Cuda 273 SS Drum brakes front and rear. I want to make this a front steer, and use a rack and pinion. Can I switch the left and right ball joints/steering arms? I plan to use the mustang II/pinto rack and pinion, will this work. I just bought a 1973 Cuda, does anyone know if there is a way to find its original color? I am restoring a 1970 CUDA 340 with option code A67. That is the Backlight Louver Package,would like some help finding out what is in the package, I know it is rear window louvers but do not know what else is in the package. Thanks for any help. 1973 barracuda cuda model 340 colour basin street blue with a white stripe owned one..
Love Mopar and your site is awesome! What is the fender tag code for white interior for a 71 Cuda? The tag is H6X and there is another number/letter after the X, but I cannot make it out. How can you tell from the VIN whether you have barracuda or a cuda? To the right in the same row “‘CUDA” appeared. The special and “CUDA make me believe it is a Cuda. are you using? Can I get your affilikate link to your host? Looking for installation instructions for a 1971 barracuda convertible top. The one that was on the car was removed and I have no clue how to put it back right. I can do it just need a little instruction on some of the things. HELP!! I had a 72 Barracuda years ago.It had a 318 and 3 speed automatic.Had the standard hood and rear luggage rack.For some reason the tops of fenders were painted black like the stripes on the sides.With the fender mount turn signal indicator lights. All the pictures of this color scheme seem to show the car with the duel hood scoops.Could my car have had a different hood originally?